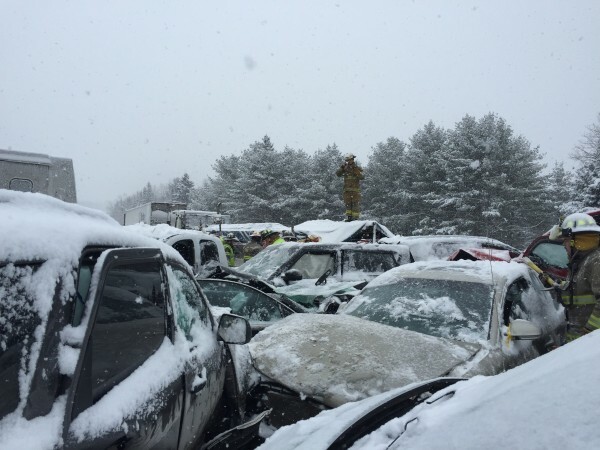 Interstate 95 northbound between Newport and Bangor was shut down Wednesday morning because of a pileup involving 75 vehicles. HAMPDEN, Maine — Al Nygren had finished his shift at the Waterville Fire Department and was driving home to Hampden early Wednesday morning when he saw red taillights flash in front of him through the snow falling on Interstate 95. Nygren, 47, an experienced firefighter and emergency medical technician, safely stopped his four-wheel drive pickup truck amid the smashed and dented vehicles and, without wearing a jacket or gloves, began doing the job he was trained to do. “I started doing triage, trying to figure out who was worse off. I had to climb over cars packed together, almost in one piece. I’d stop on every one I could, push the snow away hoping what I would see inside was good, and ask anyone if they were hurt,” said Nygren, who began his firefighting career in Brewer in 1989. Nygren, stepping from hood to hood, figures he checked the people in 20 or 30 cars. The toughest part was finding someone in pain from a broken bone or other injury who, because they weren’t in imminent medical peril, he told to hang on before moving to the next car. In one vehicle was a lady who told him she thought she was having a heart attack. She was the first who needed medical attention, he decided. He used his cellphone to call 911 and direct ambulance attendants to her car, one of seven ambulances he would call for during the ordeal. He even suggested the best route for the ambulance to use to get to her quickly. Nygren said people involved in the accident or simply stuck behind it exited their vehicles and helped carry litters bearing the injured. One bystander in a white pickup truck saw Nygren’s bare hands and gave him his gloves.